At Dr Rod Kaufman, our staff is friendly and professional. Our commitment is to provide exceptional customer service to all of our Syracuse patients. We take pride in our personalized care and strive to spend the necessary time with each patient to ensure a comfortable experience. Our Syracuse optometry professionals are passionate about providing high-quality care to our family of patients. We focus on providing comprehensive eye exams, a large selection of fashionable eyewear, and the best possible vision care. Come in today to meet our Syracuse staff and make an appointment. 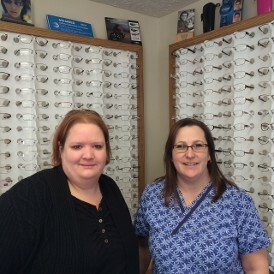 Amanda is an American Board of Opticianry Certified optician with over 18 years of experience in the field. She also volunteers with Elkhart County Special Olympics and various local roller derby teams. You will often find Mary assisting the doctor with exams. Mary has been at our office for 2 years and has over 18 years of experience in the field. Mary also enjoys spending time on the Lake with her husband and kids.